So Christmas is long gone, you’re back at work and the reality of another year has sunk in… Well, the best way to perk up is to start planning your next holiday. Here’s how! While we’d all like to jet off to Spain or Cuba or the Seychelles for a holiday treat, the reality is that many of us are still paying off last year’s holiday. If you need a little help in the savings department, keep reading! First, you need to sit down and nut out a realistic travel plan so you can work out exactly how much you’ll need to save. A romantic weekend in NSW’s Blue Mountains, perhaps? A week in the Whitsundays and Great Barrier Reef? An overseas adventure to tick a few countries off the bucket list? Whatever your plan, you’ll need to consider how much time you can get off work (and start negotiating with your boss now to avoid disappointment), what kind of accommodation you’re after and how expensive your days will be. Will you be touring around on hot air balloons, visiting theme parks and splurging on degustation dinners, or will you be enjoying quiet, low-budget days reading by the pool? Don’t forget to include extra costs like travel insurance, transport and currency conversion fees. 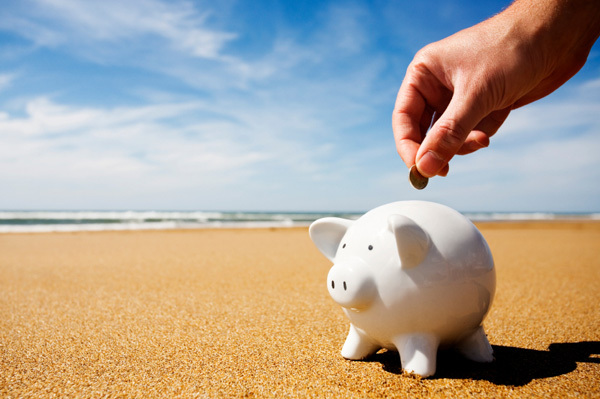 If you’re planning a getaway, you should save for about four or five months. Work out how much you’ll need to save from your pay packet each week, fortnight or month. One of the easiest ways to save is to set up a high-interest savings account that will direct debit from your everyday statement account. Having a separate, designated account will make you feel more accountable — and will make you feel way too guilty to withdraw! Just ensure you have enough money in your statement account for the savings account to withdraw from, or you’ll cop hefty bank fees. Shop around to make sure you’ve found the best interest rate and account features to suit your needs. Consider what you can cut from your daily life that won’t impact on you too much but will add up to an extra night’s stay in your hotel, a day pass on the ski fields or a carton of take-home wine from the Hunter Valley. If you made coffee at work instead of purchasing your $3 takeaway each day, you’d save $60 a month — that’s $240 in just four months! If you come home from a night out with a purse full of change, drop your coins into a jar and see how they add up over the course of the next few months. Take advantage of coupons and discount vouchers, but don’t be tempted to buy extra goods or services just because you can get a discount! You’ll be surprised how much you can actually save by reading those catalogues from the supermarket and timing your purchases right. Dine in instead of eating out and the same goes for drinks. Invite the girls over for wine and chocolate in the living room instead of heading out and paying $8 per glass. Ask friends or family to help you out with babysitting instead of spending loads on expensive babysitters.